Curiosity and Wonder…these are the traits that children naturally possess that help them learn about the world around them and how it works. Sadly, often our interactions with children and our busy schedules as adults, prevent children from having time to act on their curiosity and wonder. I am much to blame in this area with my own child, while in my professional life I am always striving to create more and more time for investigating and problem-solving. How is it that as parents we always manage to keep our schedules overloaded with activities? Why do we think we have to have so many activities planned? These are really questions for another post. 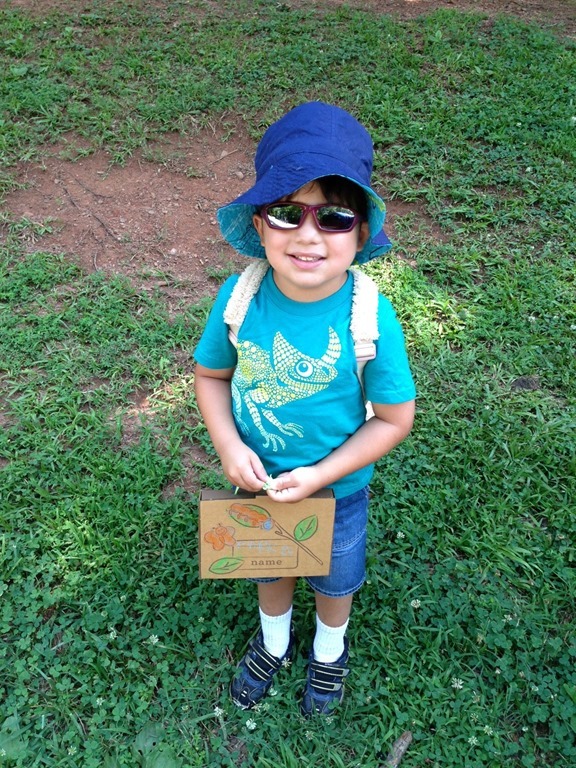 Today I wanted to celebrate the wonder of children and share a couple of things I have observed this summer. I love summer. Things calm down for me slightly and I have a lot more time to just be at home with my son, visit places in our town, and see the world from one special little boy’s perspective. This summer, we are having loads of fun together. My son turned four in May and his questioning and curiosity is at a new all time high. 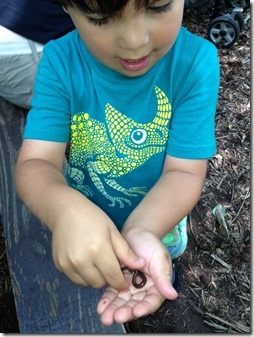 He takes everything at his own pace, watches bugs crawl and worms wiggle and desperately tries to catch a butterfly. Every morning he steps out onto our front porch to see if the spider who is camping out by our front door has made any changes to the web. Recently, we spent a day at a nearby state park with my sister and her boys. We hiked and explored the woods and then cooled off in the creek. 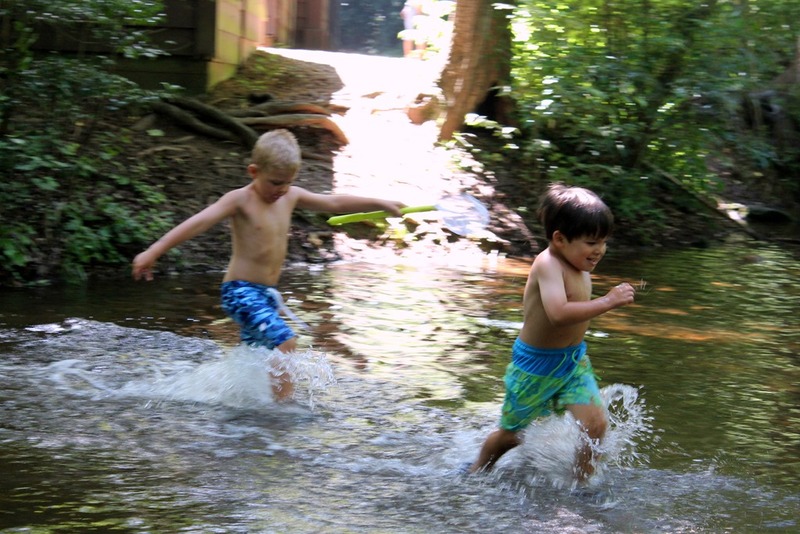 The boys went back and forth across the creek, pretending to be “motorboats” and enjoying the spray of water that surrounded them as they dragged their legs back and forth across the creek. They continued over and over again. Every now and then, one of them would say, “let’s go side to side” or “let’s go in a circle”. They were discovering the differences in the flow of the water. When they went against the flow, it was harder to pull their legs along. When they went with the flow, it was much easier. Walking in a circle had a completely different feel. They played and experimented for a long time, completely happy and free. If asked, they would not have said that they were conducting a science experiment…they would say they were having fun. Yet they were really doing both. They were learning through their play and satisfying an innate desire to know about how the world works. Today my son and I went to my parent’s house to visit. He was playing with a noodle and a water launcher on the side of the pool. I watched to see what he was doing and before long, we had an investigation in full swing. 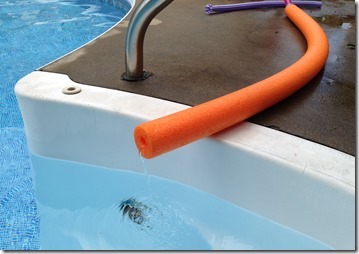 He filled the water launcher and inserted the tip into the hole in the noodle and pushed the water out through the noodle. The first time nothing happened. He did it again and this time a little bit of water came out the other end onto the concrete. He did it a few more times, each time pushing the noodle a little bit closer to the steps and watching the water. He inched it along until the end of the noodle hung out over the water. The next time he pushed the water through the noodle, he let out a shriek of excitement as he watched the water come out the other end in a stream, straight into the pool. I could feel myself getting excited too and more interested in the scientific process that was being played out in front of me. Next my son decided he wanted to make the tube longer. He added another hose-like water toy to the noodle, but couldn’t connect the two together. He asked me to hold it against the end of the noodle, which I did. 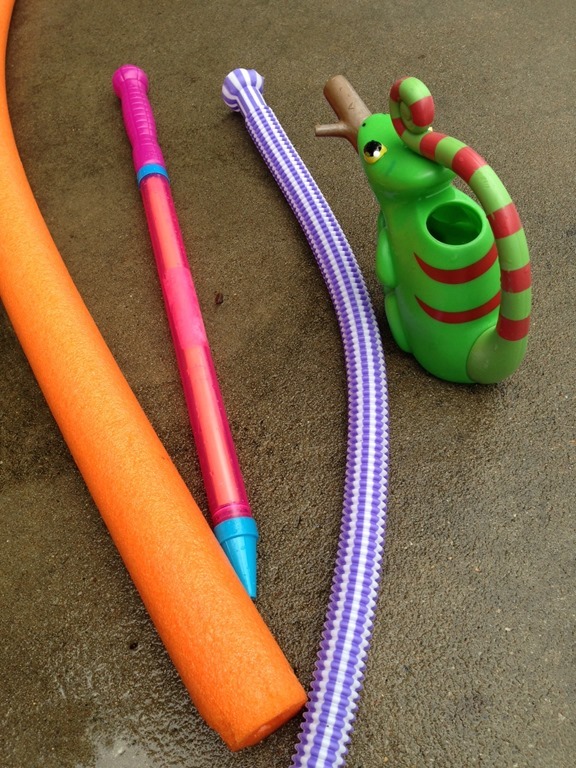 Then he filled his water launcher and shot the water through the “hose”. It took a few tries to figure out just how to hold the two tubes together to get the water through, but he did it and several times said, “Try again” (talking to himself). In the end, he decided to hold up the second tube and use a watering can to get more water into the tubes faster. It was a great success. While he does have a good attention span, I was even amazed at his perseverance and effort to find the solution to his problem. 1. When children are interested in something, they will stick with it until they feel it is completed. 2. Children have lots of questions about the world. They may not always know how to articulate what they want to know, but they learn by exploring and experimenting with things around them. 3. As I have said before, children need time to investigate and problem solve. We have to give them that time and let them know that it is okay and encouraged to spend time trying out their ideas. 4. Children can spur adults on to increased curiosity and wonder of the world we often take for granted. We can learn about the world by seeing it though our children’s eyes.